The Labor Day Carnival Celebration 2014 thread. But but but how are we supposed to shake everyone's bones for 72 hours straight if they seize the speakers? Do you think we will still be able to buy $5 nutcrackers or nemos? I hope so! lol I can't wait to eat sum curried goat roti. I'm sure the NYPD will overlook the nutcrackers. If they seize them and the boomboxes the whole holiday would have to be called off curried goat roti and all. Is it just me or has it been more quiet this year so far? It seems to get more quiet each year. As the area around EP has changed, so has the manner in which the holiday weekend is celebrated. BTW, am I the only one who notices punctuation problems on the flyer? It has definitely been more quiet the last few years, mainly in relation to the parade adjacent noise. I don't mind the parade itself. What drives me crazy are the DJs with massive sound systems blaring the worst mixes in human history 24 hours a day. I remember the one year hearing Celine Dion, mixed with Rueben Studdard, mixed with Peabo Bryson, all with some DJ screaming over the music, plus eight more layers of airhorns and laser sounds. This would go on literally non-stop, day and night. All day I can deal with, but when it gets to be 1 AM, 2 AM, 3 AM, 4 AM and the music is still blaring just as loudly that just isn't cool. I have nothing against the parade proper. It's the parade adjacent jackassery that drives me nuts. Agreed; it is definitely more quiet the last few years. For this year, amazingly, I haven't heard anything yet. @mcpoet, I feel the same way. I used to live about 3/4 of a mile from Eastern Parkway and really enjoyed making my way up there on parade day to check out the scene and people watch. Two years ago I moved to a different block, where the festivities (and loud, loud music) started the Thursday before and didn't stop until Monday night. Now I always go out of town for that weekend. I still like checking out photos of the amazing costumes online though! Oddly quiet again last night. I live on EP near Franklin, and its a great place to live 363 days of the year. Hopefully I can add a couple nights to that number if it stays quiet tonight/tomorrow....but I doubt it. Havent had dj's outside the window, just guys getting progressively drunker/louder. Oh, and if you have kids, Staten Island is having a little county fair through the weekend.....that's where I'll be skiddadling for Monday! 1. St John's between Kingston and Utica. 2. The parking lot behind the Brooklyn Museum. Note, if you have the means, I'd recommend the latter. It has a different crowd, and the sound systems are of better quality. You'll need to pay about $50 for a ticket to get in. Coincidentally, I've was out of town for last year's parade, and we'll be gone for this year's as well. The one thing I noticed in 2011 was that the sounds systems on the floats became audible well away from Eastern Parkway. I don't remember that in prior years. The parade is what it is. I can't believe those sound system aren't in violation of some kind of noise regulation, but it's not my eardrums getting blown out. So, is this crackdown the parade's edition of "Broken Windows"? Note: I'm confident that an even larger number of New Yorkers wish the police would/could go about their jobs in a way that people were not killed while be taken into custody for minor or major offenses. (if I am wrong, I am moving). As I said in another thread, I've love to see violators of the pooper-scooper laws included in the crackdown. I think people who don't pick up after their dogs have a good chance of being seen by a cop this weekend, and thus ticketed. This is in contrast to other weekends. Parties happen for a sustained period of time in a fixed location. It is not hard for cops to be at the right place at the right time. People who don't pick up after their dogs are mobile and the actual pooping doesn't take long. It is hard for cops to be at the right place at the right time. You can say the same for speeding or other moving violations. Stationary poop cameras at known problem locations might be an answer. Maybe a fishing analogy is the way to go? As opposed to regular fishing this weekend is the equivalent of fishing in a barrel? The likelihood of seeing a crime (no matter how petty) correlates closely to assigning police on foot patrols. Related question: If you warn the fish in the barrel that you are about to fish, is it then more of a "sport"? I answer "no"
Actually, I'm taking full credit for this flyer. I suggested it in http://www.brooklynian.com/discussion/34341/mr-mayor-i39ve-had-enough-of-the-w-i-day-parade-through-crown-heights-north/p2 this thread back in 2011, and my ego is such that I'm chosing to believe that the police saw it and said "That's a damn good idea!". Damn, I am only powerful enough to get a mural painted on a concrete tree base. Also states "no alcoholic beverages allowed"
I can't remember seeing advertising for past WI parades stating that. Does your plan merely involve flyers that advise people not to drink along the parade route, or actual enforcement? Do you hope that NYC eventually resembles other cities? In other cities, the bars, liquor stores, etc located near big events are told that they can not serve or sell on the day of the event. Of course, it doesn't eliminate the associated behaviors, but they seem to believe it puts a damper on it. Are you prepared to be called a cultural imperialist by people who believe such behavior is cultural and should therefore be respected and/or celebrated? Am I mistaken or does anyone else feel it in the air? Walking EP today it just felt like a different vibe. More energy or something, like its building up. Hopefully in a good way....since I was awake by honking and what sounded like an accident, as of 3am. I guess the prep (barriers going up) is screwing up traffic. Even though I'll be leaving for the day, crossing fingers that this year there are zero serious incidents (fatalities, shootings, fights). Vegas should have an over/under on this. Not a cultural imperialist, but just a realist. Drinking on the streets contributes to bad behavior, which often leads to fights, which often leads to worse. There is no "right" to drink on the street generally, and therefore, no "right" to drink in the middle of the parade. Plus if it keeps people from falling on the street in front of moving vehicles or mouthing off to cops who are already afraid from the sheer number of black folks surrounding them, then so much the better. Plus, neither you nor I nor anyone else knows what's in any particular Nutcraker. People could drink them expecting one outcome and have a completely different reaction. I don't want to see businesses barred from serving alcohol, but that they be reminded that they are responsible for the conduct of patrons that are overserved. It's amazing how responsible bar and restaurant owners are when you use the words liability and lawsuit. Do I want enforcement? I'd like cops to do what they do at other parades which is if someone is intoxicated to the point where they look like they may present a danger to themselves, then detain them until such time as either help arrives or they sober up. Personally, I think that West Indians don't need alcohol to get the party going, they just need to jump up and wind. I hope that we'll see cool temperatures, police who are enjoying the party, and parade goers that are turned up without the use of illicit substances. I wonder if this means that beer companies will NOT be sponsoring the W.I. Day parade thins year. I think that was an issue in previous years and the participants complained that, without this sponsorship, they could not put on such a parade. I have notice that the parade has become quieter and more organized in the past few years. Quieter is a relative term; it still loud as hell, but less hellish than in years past. Also, down where I am, near Albany Av, come 6PM, the festivities are basically over. I still generally stay inside my house with the AC running and my stereo played at a fairly loud level. Beer companies are already doing their part. I live on New York Avenue and a few houses away from me a house has two different banners from liquor companies supporting the parade. Saturday evening is the steel pan band competition behind the Brooklyn Museum. Cops EVERYWHERE on Nostrand this morning. And last night. Where the heck are all of the garbage cans that used to be on Eastern Parkway? This happens every year and every year the parkway is covered in trash...BECAUSE THERE IS NOWHERE TO THROW YOUR GARBAGE. Why Department of Sanitation?!?!? WHY!?!?!? Yea they do it every year. The trash is annoying but remember what happened at the Boston Marathon a couple of years? Pretty sure that's why. Lots of fun photos of today's kids parade on my Facebook feed that I am too lazy to post. Whaaaat? Where will it go? Maybe it is the weather, but it is SO quiet in my neck of the woods. J'ouvert happens tonight (early Monday morning) beginning at around 3 AM. I believe it happens at GAP, or on Empire Blvd. It is sort of unplanned. Hopefully it will be free from serious incidents. The police scanner sites will tell us if that turns out to not be the case. On the contrary. Its on flatbush ave between the library and the botanic garden. bands are playing and you check em out and pick one to dance along with. Heard this is the parade to go to. Please, please be true. The parade causes an area of (approximately) 2.4 miles by 1 mile to be closed to traffic. I know of no other parade that closes such a large, primarily, residential area and inconveniences/impacts so many local residents. Putting this parade somewhere else, would actually give me and my family a holiday/extended weekend that we can actually use and enjoy. One where we can go out and enjoy ourselves and come back at our leisure and not be a prisoner in our own neighborhoods; unable to go and come from our our own homes as we please; unable to shop on Monday for back to school items, benefiting from the extended weekend and labor day sales - instead, everything has to be done Saturday or Sunday, like any other weekend; and if we are out and about, unable to come back to our home at a reasonable hour so our children can go to bed at bedtime so they can have a good night's sleep and not be tired and cranky when I'm heading off to work on Tuesday. And this doesn't have to be the case. Why not use one of the Avenues in Midtoown Manhattan, as most other parades do. It's and extended weekend, and people that don't want to participate or be inconvenienced by the parade can just avoid the area. Southbound traffic from Atlantic Avenue to Eastern Parkway between Utica Avenue and Flatbush Avenue. Northbound traffic from Empire Blvd. to Eastern Parkway between Utica Avenue and Flatbush Avenue. Northbound traffic on Flatbush Avenue from Church Avenue to Grand Army Plaza. Southbound traffic on Flatbush Avenue from Grand Army Plaza to Empire Blvd. Southbound traffic on Ocean Avenue from Empire Blvd. to Parkside Avenue. Northbound traffic on Ocean Avenue from Parkside Avenue to Empire Blvd. You can leave, but you can not return. Not fun! If the rumor is true, I suspect it will be announced and discussed in several reputable media outlets. Readers would be wise to hold off mourning or celebrating until then. Doesn't J'ourvert seem to cluster at either the Empire Blvd end or GAP end? The years I've gone, it had problems with the marching/moving aspect. It was a blob. From what I understand, many aspects of J'ourvert aren't planned. Meaning that a large group of revelers gets together and then celebrates. As a result, it kind of happens where people get together, and then the crowd builds. Sometimes they manage to move, other times they seem to celebrate in one spot. Historically, Flatbush between GAP and Empire is a popular spot and the NYPD closes it to accommodate the crowds. well from our older white folk who dont actually get out to these events, but do try to live vicariously, while getting a good nights sleep, the info I have acquired is that the different bands are on flatbush between the gap and empire, and play and people mingle and go around to listen to which band they want to dance with and then at some point the bands and the people move down empire to nostrand to church avenue. 3 a.m. be out there, but dont quote me. another time I heard 6 am. (maybe thats when they get moving down Empire. But a lot of milling about and music down on flatbush between the parks is where it all gets started. Dont wear your best clothes. When I went, there was a crowd of people at Empire and Flatbush, and another at GAP. Between the two points was just bored NYPD, and people walking to see if it was any more exciting "over there". Reportedly there was much dancing on top of the police car after the video was taken. Windshield was broken. There was short lived fight between the crowd and responding police. "Unfortunately someone was just shot here on Empire between Nostrand and Rogers. Not sure how this affects Jouvert and the rest of Carnival. Definitely ruined my (and many other people's) night. Hopefully the rest of carnival is peaceful." Which seems to indicate that a police vehicle was involved in an accident. Stay safe, everyone. I hate that this violence casts such an awful light on what could be a great parade, and what is a great neighborhood filled with great people. 364 days of the year I loved living there...but I don't miss it this weekend. How large is this event? Brooklyn: Lincoln Place & Classon Ave. NYPD reporting a person slashed, EMS transported to Kings County hospital. Crime scene established. I am out of town for the weekend like every Labor Day weekend. Usually I leave on Fridays but this year I left on Saturday and had the weave in and out of the children's parade on St. John's. This parade was extremely loud. I doubt that power generators with DJs blaring music was part of the original parade plan. I can rant on and on about the disturbance this parade causes: the parking issue and the garbage, the noise, the length and so on. By no means I am suggesting to end this parade thou I wouldn't shed a tear, rather perhaps it's high time this parade is looked at and maybe just maybe tweaked a bit. Just saying. There were porta potties with $1 signs on them on Franklin just south of the parkway on Saturday too. The church was at least selling access to a toilet that flushed. "Just three blocks from the earlier fatal triple shooting, a 22-year-old man was shot in the foot near McKeever Place and Sullivan Place at 4:35 a.m., cops said. The victim, who was uncooperative with investigators, was taken to Kings County Hospital with a non-life-threatening wound. There were no immediate arrests." This intersection is near the McDonald's on Empire. The parade causes an area of (approximately) 2.4 miles by 1 mile to be closed to traffic. I know of no other parade that closes such a large, primarily, residential area and inconveniences/impacts so many local residents. This is the largest parade in the city, according to the city's own statistics: 2 million people. So of course it is extraordinary. The St Patrick's Day parade, by contrast, has only 150,000 estimated attendees, but still snarls traffic and transit in the heart of Manhattan for the day, on a weekday -- and if you have ever lived in the East 60s on St. Patrick's Day then you know that this largely residential area turns into a disaster zone of drunk and disorderly white people vomiting in the streets. Why there are fewer arrests and less gunplay is a matter for the sociologists. She was walked past us on her way off and acting like a complete jerk; she was the only one I saw have any problems with the police so I'm guessing her arrest was well deserved. 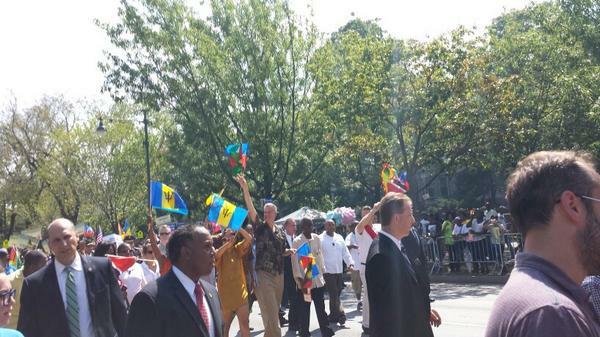 The West Indian Day Parade is awesome. Today and the whole weekend were great. I can't wait for next year. It is really amazing how the city manages to pull off such a massive undertaking every year. At 9:45 PM, Eastern Parkway has been reopened to traffic and an army of Sanitation workers is working its way west from Utica. By 3 AM, the parkway service roads are usually as clean as they were on Saturday. Brooklyn cops were ordered to ignore blatantly illegal liquor sales inside three junkyards that were turned into open-air nightclubs — drawing thousands of rowdy revelers who vomited and urinated in the streets during the Labor Day weekend, The Post has learned. Interesting that the Post had a reporter out in Carnarsie covering these parties. This seems sort of akin to covering the parties out on Long Island that take place on St. Patricks Day. 1. Such coverage does not happen. 2. Many of the people at these remote parties never make it to the site of the parade. BTW, I saw police officers walking by people who were obviously selling Nutcrackers and beer from coolers who kept walking. So, the crackdown had some discretion to it. Personally, my favorite guy hung out by the stall selling non-alcoholic fruity drinks: For a few dollars, he would spike your drink for you using a big half gallon of rum he had in a bag. Snarling traffic and closing off streets are not comparable. I suspect that there are more streets closed in proximity to this parade as a result of its larger size, as well provide quick access for emergency personnel. For example, ambulances were stationed along Union and Lincoln, ready to quickly care for anyone who was the victim of violence, overconsumption of substances, heat exhaustion or any other malady. Heat doesn't play a role in St. Patricks day. In terms of size, the Thanksgiving Parade is probably the most similar. Not surprisingly, Elmo floating thru the air does not attract young men to the same degree as women in small, sparkly outfits. I agree @whynot, that this parade is probably closest to impact of the Thanksgiving Day parade in terms of amount of disruption through the local area. One of the things that I think gets lost here is that local non-WI NY'ers keep wanting to call this a parade, like Thanksgiving or St. Patricks Day or any of the other ethnic parades in the city. But the event was conceptualized, designed and replicated Carnival as is celebrated in Europe and the Americas which is a multi-day event with a culminating parade that may last for most of a day. Its a larger event, that can last several days. The logic of "it no longer belongs here, because now I live here" may work for some, but moving a multi-day carnival to Fifth Avenue in Manhattan or Central Park doesn't make a lot of sense when you think about what the event is supposed to be. Perhaps somewhere like Floyd Bennett Field, Randalls Island, or Governor's Island makes more sense, but I think you'll have consitutencies at all of those venues that will say that it doesn't "belong" there either. Floyd Bennett Field, what a great idea! On many college campuses, St. Patricks Day is an event that can last for days. At my college, it would culminate in "walks of shame", burning used couches in the street that were specifically procured for the occasion, and late night fights with the police. Ok, saw the term several times and need a definition. What's a nutcracker? In this instance, it is alcohol fortified punch, sold in plastic containers, by guys standing by coolers. They announce the availability somewhat selectively, and discreetly, based on who is walking by. @homeowner said - I agree @whynot, that this parade is probably closest to impact of the Thanksgiving Day parade in terms of amount of disruption through the local area. I'm thinking something akin to Burning Man... A destination multi-day event that is out of the way where revelers can party as much as they want without bothering those not participating. This would be awesome for everyone involved. I don't see a downside. With regard to "it no longer belongs here, because now I live here," that is unfair. For many, it's not "'now' I live here;" it's "I've always lived here" and/or "my family has lived here since the parade was still in Harlem." And disregarding when one moved to the area, over the year's, as the parade has grown and more streets blocked off, it has become more and more of an inconvenience for those not participating. I totally get that if one moved to the area a month ago and complains, they should have taken this into consideration before choosing to settle here. But if one is living here for, say, 10 years, they would notice that the facts and circumstances and those impacted changed quite a bit; 20 years, even more so... And one can't say this is what they signed up for. I think there is something important about being able to walk to and walk home from an event/parade such as Carnival. Sequestering it at the far edge of Brooklyn (Floyd Bennett Field) or on an island (Randall's/Governor's Island) would kill the spirit of it. Most, if not all, of the stands that sell food or crafts/art/etc- all come from other areas with vans and trucks and unload. I'm never seen anyone walk out of their apartment on the parkway and set up (aside from the guys with coolers selling drinks). So they'd be trucking their goods either way. Unfortunately, I don't think you can turn Carnival into a Burning Man type of event, where people that don't want to participate never have to see any of the people engaged in the event. Its a carnival in a city, and it's been pretty highly localized into one neighborhood for many years (first Harlem as you pointed out, then Crown Heights). The reason that I mentioned Floyd Bennett Field is that a lot of the Caribbean population that has been pushed out of central Brooklyn has moved to Canarsie. FBF is close enought that it would work there (although the folks in the Rockaways might have complaints if the bridge backs up). Some might say that the sheer number of street closures need to be lessened, especially as the day goes on. I know that I was out after the kids parade was over and the cops got traffic flowing pretty quickly . It seemed like most of the jam was before noon and traffic was moving pretty quickly from that point on. I don't believe that anyone is a hostage in their own home for the entire weekend unless they want to be. Its pretty easy to get off and on the subways that aren't directly along the parade route, and even driving while a hassle at the height of the parade, is normal by 8:00pm or so. In southeast CH, all subways are directly on the parade route - Nostrand, Kingston, and Schenectady/Utica. One can of-course walk to President or Sterling, but that can be a 20-30 minute walk as one lives closer to Lincoln Terrace Park. When out with the family, I prefer to be home well before 8pm. I did realize something interesting this year - Troy south of EP/north of Empire was open to all traffic before the parade ended. Traffic was horrendous, but open nonetheless. I am not sure where everyone was going as EP was still closed, but they were heading in that direction. Kingston was closed until the end and seemed to be used as a NYPD and FDNY parking lot. Don't know about any others. Police were letting cars through certain barricades if you showed your ID (proof of address). That's how we got through. We did indeed feel like hostages when we first moved, as living directly on EP with a baby (thus stroller) makes it nearly impossible to navigate. Labor day is a day away from the hood for us now. I spent my subway ride home listing all of the city's big events in my head, and predicting whether the affected local residents believed that the event would be better if it was held elsewhere. So far, it is true in all cases. I got on the 4 train at Franklin Avenue at 4pm and it was half as crowded as it is at 8am on weekdays. Someone who can't handle the Carnival b/c of the traffic is doing city life incorrectly. I live on st. marks so other than crowded sidewalks, I am not impeded. But if I lived on the parkway or one or two blocks off, than life would be seriously bad. I think residents who have cars that and depend on street parking tend to leave the city the most. Many streets where they regularly park are deemed tow zones, so having a "homeless car" helps them make the decision. Let's also keep in mind that there is only one way to get to Floyd Bennett Field directly by mass transit: the Q35 bus. In contrast, there are multiple ways to get to the parade route on Eastern Parkway by mass transit. There are also multiple ways to get to the parades that take place in Manhattan on Fifth Avenue. Apparently... "De Blasio ordered NYPD to back off illegal bash"
Let's see where this goes. Doesn't seem like the Post is giving this one up. I live on the parkway- my apartment faces the street. It is a life of 'join 'em or leave' Labor Day weekend. For 15 years, I had an open house party and invited all my friends to celebrate. It was one of my favorite days. Now that the luster has dissipated (thanks to being that much older now)- it's turned into something different. We avoid it, must move the car (and cannot bring it back until Tuesday at 6am- it used to be you put your car back Monday night after 9pm), and after having Lil' Whatchuwant, we leave for the weekend so he can nap and sleep at night (bedroom faces the museum). We got a hard time Monday night (9pm) trying to get on our block simply to unload the car. Cops stood there, jaws slack, looking at one another trying to decide. I had to explain 3 times we were 'just loading, not parking.' They finally relented- informed us we would get towed if we parked. I said I understood and we were allowed to pass through. It is ABSOLUTELY an inconvenience if you don't want to participate and even if you do. It can be frustrating, but we are in a position where we can leave town easily and stay with family. We are extremely fortunate and grateful for that and realize we're an exception. My neighbor in 9 months preggo. They tried to go to a hotel for the weekend, but everything was booked. They returned home and hunkered down for the weekend and prayed she didn't go into labor. The Post seems to consistently believe that hands of law enforcement are being tied, and that the city will descend into anarchy as a result. So I take their reporting with a grain of salt. Sorry to hear it's become such an inconvenience. I'm on the ground floor, Union @ Franklin, not far from you. My kids had a blast and slept well, as did I despite the street party that went late right outside my window. I also watched cars parked on our block after the parade easily drive out onto Franklin and off towards Empire with no problems (arguably even easier than on other days as no cars were coming over EP on Franklin). I also watched cars parked on our block after the parade easily drive out onto Franklin and off towards Empire with no problems (arguably even easier than on other days as no cars were coming over EP on Franklin). Going towards Empire, away from the parade, is possible throughout the day as there aren't any restrictions going in that direction. Trying to get north from Empire, that is where the street closures/restrictions come into play. I think the worst days for traffic are the 5 Boro bike tour, and the NYC marathon. Those events tie up the whole city, and smart drivers know to avoid even thinking about driving anywhere on the dates they are scheduled. Honestly, I'd be heartbroken if the parade got canceled. I understand it's a little noisy and can make our neighborhood tougher to get around but it's navigable. As for the "I can't drive anywhere!" crowd. You're in a city with great mass transit and it's only one (1) day a year can't you just deal with it? I know I can. If the parade goes away we will lose such a cultural icon for our area. It really makes our community stand out from other completely pedestrian areas of Brooklyn. However these rumours seem a lot like the trader joes rumors. We should be careful that the Brooklynian doesn't become flooded with false rumours. THIS. You may have to walk a little further to get to a subway station or a bus stop to get you out of the neighborhood, but it's possible. Years ago I remember going to a barbecue at a house of a family friend who lived in northern Crown Heights. I walked up the hill with my parents (I live in SW Crown Heights), and we walked through the Eastern Parkway train station to cross (under) the parade route. Taking the B48 obviously was not an option. LOL Yet, it wasn't terrible, and by the time we reached our destination, we were removed from much of the hubbub. The parade has been a staple of the neighborhood; why not adapt to it? We should be careful that the Brooklynian doesn't become flooded with false rumours. The online world is very similar to the real world in that it is largely up to the reader/listener, to determine for themselves what is credible and what isn't. Not everyone is going to be listened to or believed. Not everyone is going to like carnival weekend. Some people will be unhappy.